Spokes had no wish to re-ignite the helmet debate. We’d rather spend our limited volunteer time promoting cycling and lobbying for improved cycling conditions – one of the best ways to improve personal and public health. Unfortunately we have reached the position where some major charity rides are now prohibiting young adults unless they are helmeted, where some official websites and publications will not include cycling pictures unless helmeted, and where some cyclists have reported being shouted at for not being helmeted. The issue was covered in Spokes Bulletin 113, and this generated massive public interest – the majority of it sympathetic to our concerns. Spokes does not have the time or resources to mount a major campaign on this – that is up to national cycling organisations – but, in view of the interest, we have published a factsheet [pdf 390k] summarising our concerns and the arguments. Please print or reproduce the factsheet if you find it useful. We also hope that other cycling organisations will follow our example – and some are already saying they will do so – see below. Our basic point is that using a helmet should be a choice – but also an informed choice. Police, sales outlets and other helmet-promoting organisations should give the whole picture. Public and publicly-funded bodies such as Cycling Scotland should be balanced in their use of pictures. Bodies with a commercial interest in helmets should be required to explain the cons as well as the pros. Evidence suggests that compulsion or heavy promotion of helmets puts some people off – whether because it makes cycling seem risky, or a hassle, or uncool – and so major health benefits can be lost. Yet everyday non-sport cycling is just as safe as many other daily activities. And people choosing to use a helmet need to know, for example, that although it may well help protect the head when falling onto the ground, it may also encourage drivers to pass closer, it may give an unwise confidence to use a faster road, and it will do little to help in collisions with a motor vehicle. This knowledge will itself help helmet users to ride more safely. A greater understanding of helmet issues is really important because countries where helmets have become more popular (whether through commercialism, public promotion or compulsion) have generally seen no improvement in cycling deaths and serious injuries per mile cycled, and in some the position has worsened. Note: Spokes is not involved in Sport, and can’t comment on helmets for sport cycling. See the CTC briefings instead. “A quick word to welcome Spokes’ action to stop publicising rides that require helmets. It’s about time that someone took the initiative on this and I hope that other groups will follow suit.” John Franklin, registered Expert Witness on cycling skills and safety, author of ROSPA-recommended book Cyclecraft, www.cyclecraft.co.uk. “Asked to appear on Call Kaye phone-in to disagree with @SpokesLothian re helmets. Said I agree with Spokes. So not on radio today.” John Lauder, director of Sustrans Scotland. “Bold, rational move – Scottish cycling NGO withdraws support for events that encourage the use of bike helmets” Mikael Colville-Andersen, Copenhagen, Urban Consulting Expert and CEO of Copenhagenize Consulting. http://copenhagenize.com. “The Transport and Health Study Group completed an extensive review of cycling for its book Health on the Move 2. We concluded against the promotion of cycle helmets and strongly against their compulsion. … An excessive focus on helmets adds “fear” to the obstacles hindering a cycling revival. 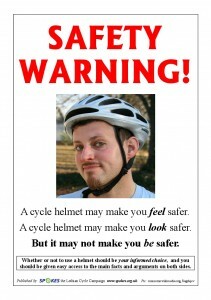 Enforced helmet compulsion reduces participation, ironically worsening safety due to lost “safety in numbers”. Malcolm Wardlaw, Executive Committee, Transport and Health Study Group. Health on the Move 2.
www.cycling-edinburgh.org.uk [website of organised bike rides around Edinburgh] “I’ve now decided to adopt the same policy for the Cycling Edinburgh website. From 1/7/12, I will no longer list organised rides where it is compulsory for adult riders to wear a helmet. Also, in choosing photos for the site, I’ll try to select examples that show a mixture of helmeted and non-helmeted riders” [Note – the spokes policy is not restricted to adults only]. language without being an expert on head trauma is misleading at best. From non-members we had several supportive comments and only 2 against – one from an individual and one from an organisation which sells decorations for cycle helmets! Links to the research evidence on helmets have been moved to our documents – advice – helmets page.